Designs by Lisa Somerville: Kitchen Sink Stamps - Have a Lucky Day! Kitchen Sink Stamps - Have a Lucky Day! Happy Kitchen Sink Stamps Monday! I hope you had a great weekend! Before I share the details on my card, I just wanted to wish Gerrie, Shelly, Sharon and Shelley all a Happy Birthday - hope you guys enjoy your day! Today could just be your lucky day! 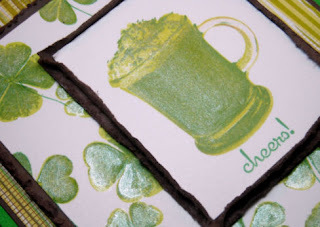 PaperTemptress and Kitchen Sink Stamps are partnering up for a St. Patty's day celebration with some great prizes, be sure to visit the PaperTemptress's Community blog for more details on how to find your clues and enter the contest. What can you win? One lucky winner will win Kitchen Sink Stamps newly released Multi Step Shamrock and Clover; 1 each of 2 inks - Memento Cottage Ivy and Pear Tart and a St. Patty's KSS Green Package from PaperTemptress. This frosty mug reminds me of a Green River Shake! I randomly stamped the Clovers from Kitchen Sink Stamps Multi Step Shamrocks and Clovers on White, then layered them on a Chocoalte Chip Panel, then added the Torn Frames Technique (past TJNL Tech). The mug is from Kitchen Sink Stamps Cup of Warm Comfort it was stamped on White with Green Inks, layered on a Chocolate Panel, again using the Torn Frames Technique. The sentiments are from Kitchen Sink Stamps Ready 4 Any Holiday. To add a bit of sparkle to my images, I lightly painted them with Creative Inspirations Winter Frost paint. Oh my gosh, how clever are you to make a green milkshake!!!! Absolutely brilliant!!! Love this card!!! Green milkshake is just so fun!! I love the beautiful dp and your custom clover dp, too! Fantastic card, Lisa!! 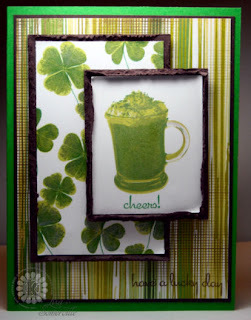 Love this fabulous St. Patrick's day card, Lisa!! What a sensational green mug and shamrock background! The exquisite distress framing looks awesome!! Hope your birthday is the greatest, as well!! What a cool card. Milkshake for St. Patrick's Day...hmmm, green beer maybe! This is one awesome card. I just love the details you added. This looks good enough to drink. You are so creative!!! Comfort set & never thought of using it like this - I will now! I'll think I'll make it an "Irish Coffee". Great job! I love the green milkshake. Here you are, again, thinking outside the mug! Super card, Lisa. How adorable.....and green milkshake...I don't think I have ever had one....but your card is yummy!!!!!!!! It reminder me of green beer and younger days gone by! Not a drinker but I love the green beer card! I was so happy to hear that paper temptress and kitchen sink stamps has paired up with each other!! I love how you made that into green beer!!! Wish I was with you on Wednesday...we could sure have some fun Chi-town. Like all those stamped shamrocks. Milkshake in a mug! How cool is that? Love your card. Your images are always so realistic. Great card Lisa! Love the green milkshake!